P. vivax is the malaria parasite responsible for the vast majority of infections outside sub-Saharan Africa. In the mBio study, an international team of researchers report that the parasite doesn't only circulate in the blood; it also takes up residence in the bone marrow. Their analysis of P. vivax infections in people and non-human primates reveals bone marrow as an important—and previously unstudied—reservoir for parasite replication and transmission. 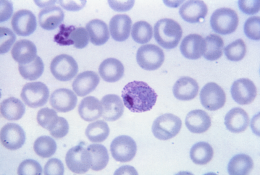 People with infections who show no signs or symptoms may host undetected parasites in their marrow, the authors conclude, and the findings may help explain why many P. vivax infections go undetected. The new study reflects a growing interest in the tropical disease community to understand P. vivax. The researchers have now begun studying the pathogenesis of infection in the bone marrow and learn more about the biology of the parasite. In addition, Marti says the biomarkers used by the team to find the hidden reservoir could inform a new generation of diagnostic tools that can finger parasites that would otherwise go undetected—and help public health officials get a better estimate of the disease burden.